Horský Park is a popular park located in the city center. The park itself is a bit more rugged, with a series of paths and stairs that can make for a surprisingly wooded and hilly run given its city location. The park features Bratislava’s church on Calvary, a Lourdes cave, an outdoor gallery of art, a traditional local pub, and a gamekeeper’s house with a small cafe. 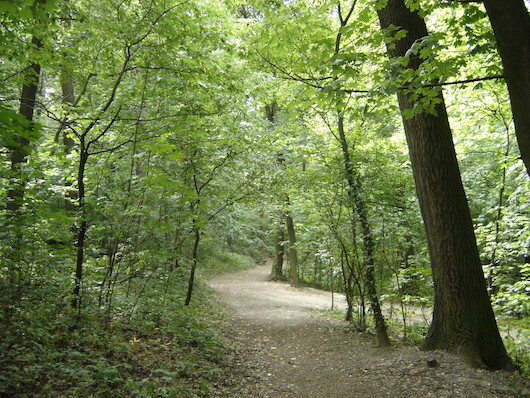 This link has a detailed description of the park’s features and numerous paths. Given the more natural state of this park, we haven’t mapped a specific route. One can put together ~2-3 km within the park (it’s 1 km east-west). It’s also great to combine with a run in Bratislava’s historic center, such as the Presidential Gardens and capital buildings 2 km to the east. From the Presidential Palace, take Štefánikova St. to Hlboká cesta to get to the park.